24 hours later, our city looked like this. I kid you not. But who cares? Because inside everything is good. I mean indoors and, well, inside. 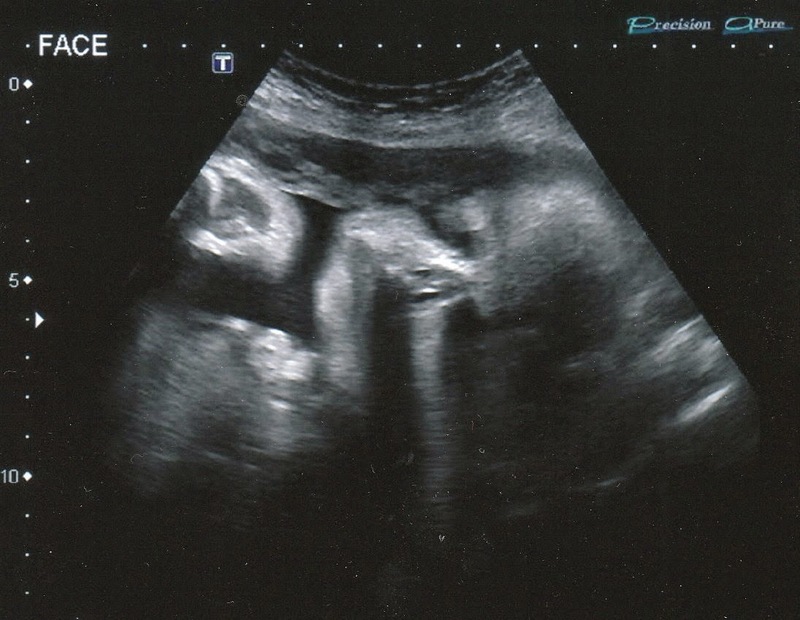 This is the Ember's photo from my U/S at 34 weeks. This is the first photo where she has her head turned to the front so you can see nostrils, eyes, and I think a little mouth. I melt. The U/S was requisitioned to monitor the fibroid near the cervix. The peek inside still shows that the fibroid is not blocking the birth canal, yay. Baby looked great as well. She had a heartbeat of 140 and did some practice breathing, although we had to wait a few minutes for her to get around to it. She was pretty mellow today although that has not been the case lately. Ember does not usually kick or move very violently but a few times the past few days I've felt as if she is trying to kick and punch her way out. When she rolls to point outwards I also get a lot of belly ripples. The doctor estimated her weight at 4.3 pounds and said she should be a bit over 7 pounds at birth if she continues this rate of growth (more snacks now, please!). I have been back at work for a couple of weeks and doing well so far. I have been responsible about eating well throughout the day so that is probably helping. I'm still waffling on how long I should stay at work. It occurred to me the other day that I think I've actually gotten used to being pregnant. It happened so slowly I didn't quite notice how, but I no longer (usually) feel like my body is some sort of dangerous anomaly that needs to be constantly monitored for unexpected behaviour. In fact, when I try to imagine not being pregnant it seems more strange. And particularly when I feel Ember wriggling about, I really do love it. I've never really gotten over my fears and anxieties, but they've faded into the background since we have been hearing nothing but good news. I just hope it stays that way. Mr. Turtle has made lots of progress painting the baby's room. We chose a bright orange-melon colour, and figure we'll contrast that with dark furniture (sort of the opposite of my original plan). The furniture has yet to materialize, but once the painting is done we'll have motivation to move on that. I ordered my first baby item (!! ): the Halo bassinest. Of course I procrastinated until it was backordered, but it should still be here in time. We start the first "baby class" this Thursday. Thinking of everyone wherever you are on your journey.